Kyle with one of the day's LM bass. It didn’t take long before Kyle and I were scrambling out of the raft in order to portage around a large impassable logjam. We laboriously pulled the raft along the white sandbar until we were clear of the obstruction. Before jumping back into the raft and continuing our float, we walked back to the large tangle of logs and limbs. Here, the water of Nelson Creek flowed slowly into a pool that was formed due to the logjam. After a couple of casts, I heard the tell-tale splashing sound of a fishing being brought to hand. I turned around to see Kyle fighting a bass with his 5-weight rod. Once the fish was about 2 yards from the bank of the sandbar, Kyle’s tippet snapped and the fish darted away into the safety of the deep tannic pool. Not a bad way to start the day, we thought. We continued to fish the deep pool for several more minutes. Eventually we pulled a yellow bass out of the depths. This was our first yellow bass on the fly. We continued our float downstream. We encountered several more areas where we had to evacuate the raft, and either pull the raft through shallow sandy sections, or portage around the obstructions. We knew this was going to be a long float, so we didn’t get to spend as much time fishing as we would have liked. 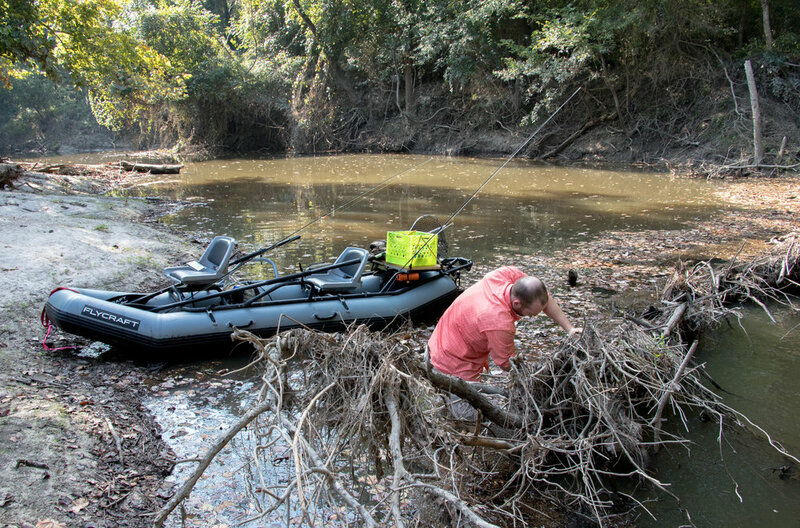 The creek presented us with fantastic looking habitat and structure, but we knew that we had to keep moving if we were going to complete the nearly 7-mile float, and get off the water at a reasonable time. 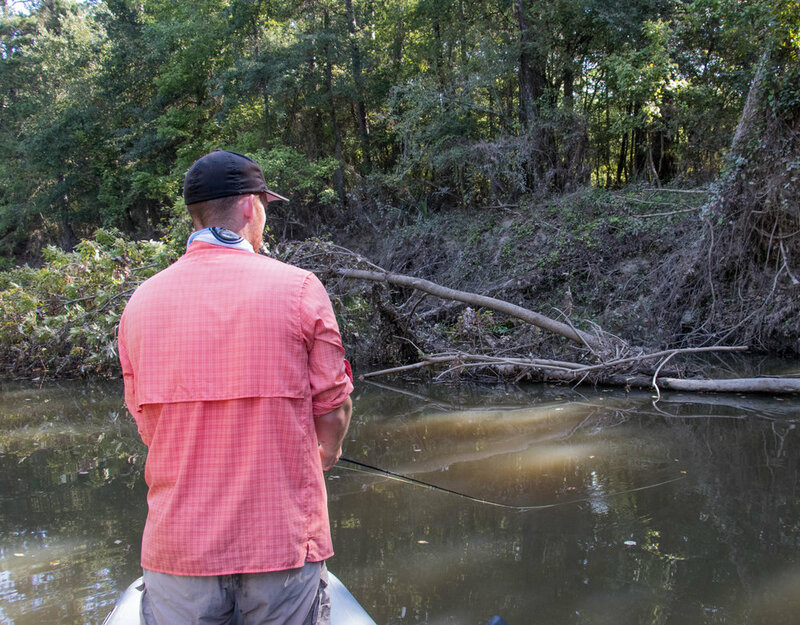 As I continuously rowed at a leisurely pace, Kyle placed well aimed casts at sunken logs and undercut banks. Several more yellow bass were brought to hand as well as several largemouth. Kyle and I lamented the fact that we didn’t have enough time on the water to fish each nook and cranny of the creek, because we knew that a big 5 pounder was lurking somewhere. But, we had to keep up our steady downstream momentum. The bass seemed to be keen on attacking Kyle’s wooly buggers and my baitfish patterns. We stopped for a quick lunch. Then, as we floated on, we began to hear the slow chugging sound of an outboard motor. The creek had been gradually getting deeper and wider as we approached its confluence with the Trinity River. Once we caught sight of our first bass boat coming up the creek, we knew our chances of hooking into bass with our fly rods had been greatly reduced and we began to row in earnest towards the Trinity. Kyle took over the oars, and rowed hard. Once we reached the Trinity, Kyle continued to row upstream for about half a mile until we saw the FM 3478 bridge. This was our takeout. After hauling the raft and all of our gear up the steep bank, we reflected on the float. The beginning portion of the float was by far the most enjoyable. The creek was deep enough that it was navigable by the Flycraft, but impassable for any boat much bigger than a canoe. The water was perfect for fishing bass around logs and sandbars that dropped off into 5’ deep holes. Had we taken more time fishing this section, I bet Kyle and I could have brought a substantially hefty bass to hand. But after all, the real joy came from exploring a brand-new piece of water that was seldom navigated and fished. NOTE: The flow and height of Nelson Creek is not monitored by the USGS. However, another tributary to the Trinity River, Bedias Creek, which is north of Nelson, is monitored by the USGS. The below images are the flow rate and gauge height of Bedias Creek. 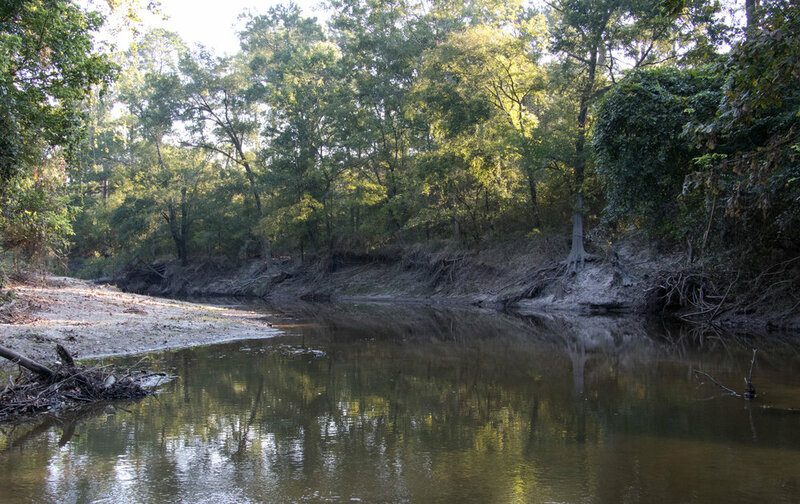 I have used Bedias as a proxy in order to try and figure out navigable flows for several tributaries to the Trinity River, including Nelson Creek. Our Nelson Creek float took place on September 23, 2017.